I’ve had some push-back on my views about socially driven innovations and that in turn means a push back on open innovation. When “The Process Innovation Imperative” was written (leading up to 2002), the 4th Generation of R&D was in full swing. The focus was on using learning theories and knowledge based approaches to drive new innovations. I do not think that learning is less important today, it is just more imbedded in the make-up of our organizations as we are educated on the possibilities of what this can bring. With regards to 4th Gen R&D, the premise of getting the customer more involved in your business is a modern phenomena; and here to stay. 1. Our culture and organization does not function like this, so how will this work? There are some undeniable evidence that movements towards a more open world is moving at a consistent pace. We do, as humans, have a problem in telling the future though. Our mental pictures of what’s possible are always different to those views of what actually happen. the result is that when we look back things don’t look so well crafted and planned. 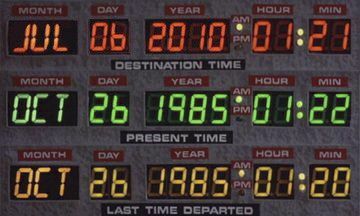 Look at “Back to the future” Marty McFly arrived in the future (a few days ago) after hitting 88mph in a Delorean in 1985. What were you thinking about innovation in 1985? Remember the hovering skateboard? There are some signs of change, especially those that are socially driven, that normally go unnoticed. This one isn’t; we are in a world where humans demand rights, want to be treated well, and feel they have the right to the benefit of their actions. Having just experienced the soccer world cup in South Africa, I once again feel that a movement like “against racism” is driving a society to believe (rightfully so) that inequality is wrong and that individuals should be valued.